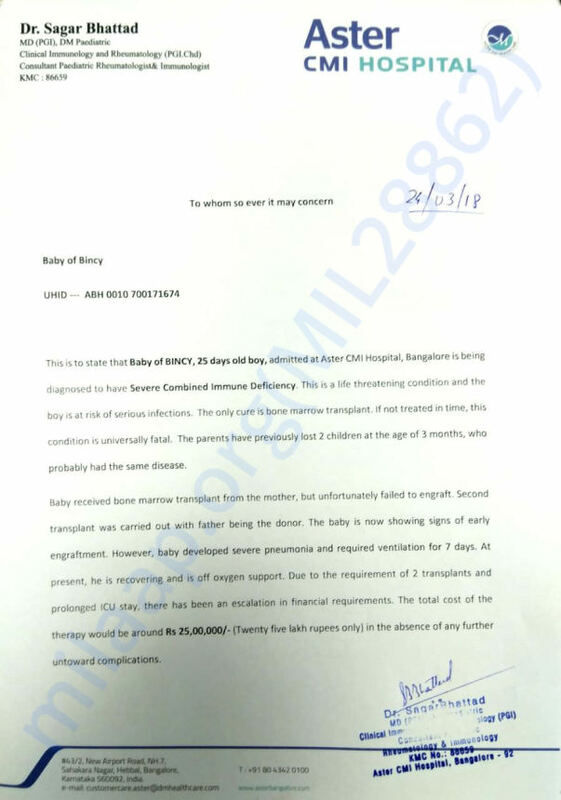 25-day-old baby of boy of Bincy and Subilesh is suffering from a life-threatening disease called Immuno Deficiency. 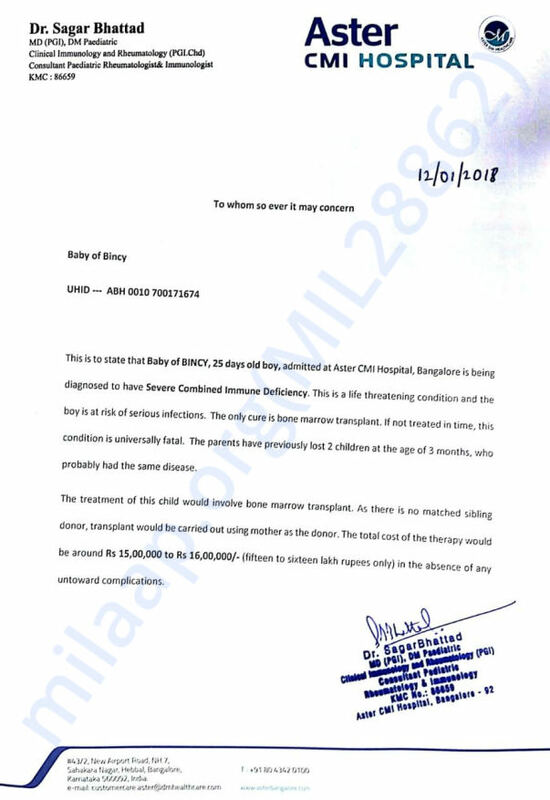 The only treatment for this is a bone marrow transplant which costs around 16 lakh Rs. unfortunately the parents do not have the funds to afford this treatment and need our help to save their baby. Unfortunately, with inexplicable grief, we're having to inform you all that the baby passed away. Even after giving the best of treatment possible, we couldn't save the baby. The family is very grateful for the support provided for their baby's treatment. All the funds raised from this campaign have been utilised towards the baby's treatment so far. Here is a quick update on baby of Bincy. Currently, baby is at home and doing fine. He had responded well to the treatment so far and showing signs of recovery. We have to visit the hospital twice in a week for routine check-ups. We are grateful to all of you for the selfless support. It would not have been possible without you. Keep sharing this campaign with your friends and family. Thank you for the love and support. Please pray for baby's speedy recovery. We have some news to share on Bincy's baby. The baby underwent the transplant but due to complications the baby had to undergo another transplant where the father was the donor. 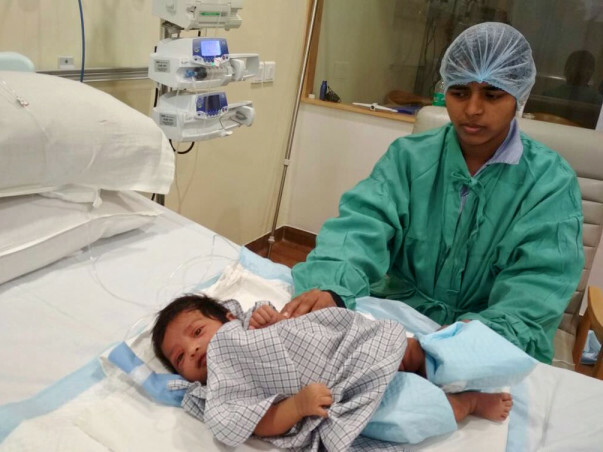 Post the transplant the baby suffered Pneumonia and required ventilator support for 10 days. He is now showing signs of recovery but will require further hospitalization. Due to all of this the cost has escalated to around 25 lakh Rs. The family needs your help and support at this time so that their baby can finally return home. Please do share this link with your friends and family.